It’s probably hard to find a moonshine and distilling enthusiast who has never wondered if they can make their own whiskey. The short answer is yes, you can! The long answer is long literally, since you will have to give your moonshine a good rest in a barrel for it to obtain the sought-after amber hue and rich flavor of a true whiskey. The good news is that it’s not that hard to make the next step and go from moonshining to whiskey making. All it takes is the original moonshine, the best whiskey making kit you can get your hands on, and a lot of patience. And the result is always really worth it! As you’ve probably guessed, in this article we’ll be talking about turning your own moonshine into original homemade whiskey as well as reviewing the best whiskey making kits you can find online. So fire up the still and get ready to go! What is a Whiskey Making Kit? Before we go deeper into whiskey making kits lets first see what whiskey actually is and how it’s different from ordinary moonshine. Technically, any type of whiskey is a grain-based spirit obtained through distillation and aged in wood barrels. That’s just fancy words for moonshine that has been set aside in an oak barrel and simply forgotten about for a couple of years. Jokes aside, whiskey is actually high-quality moonshine obtained from an exclusively grain (or corn in case of bourbon) based mash. This distinction alone results in a very mild and rich flavor, especially when a pot still is being used. However, the trademark amber color and spectacular flavor profile we usually associate with whiskeys and bourbons are obtained during the barrel-aging process that normally takes at least a couple of years. After that the end-product can also be blended with other whiskeys to obtain the desired set of flavors, but that’s talkin' high-end production distillery stuff there. So, in order to make whiskey you first need to make good moonshine and then put it in an oak barrel. And that’s exactly what a whiskey making kit is – a small oak barrel that you can age your moonshine in. 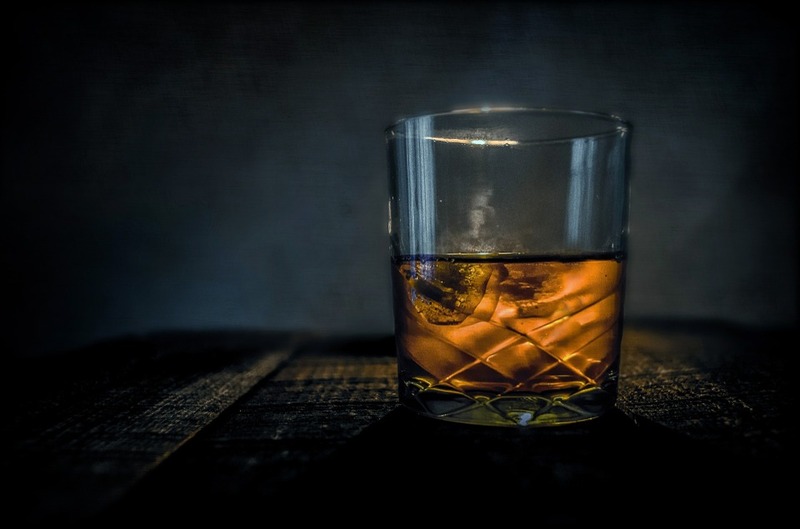 Now, depending on whether you’ve used barley malt, corn, rye malt or a mix of thereof in the mash, you will obtain what’s technically called Scotch Single Malt, Bourbon, Rye, or Blended Whiskey respectively. But the production process is the same no matter what type of whiskey you’re going after. Just make sure that your still runs smoothly and the spirit coming out of it is tasting good on its own. Then comes the part when you have to get one of those whiskey making kits and stock up on patience. There's lots of whiskey making kits available to small personal use perfect for the home distiller but the amount of options can be a bit overwhelming. When you break it down though, there are three major considerations to make: size, wood type, and intended whiskey product. These are the simplest and most affordable kits you will find online. As the name implies, they only consist of a small barrel, usually equipped with a dedicated stand, top bung and spigot. Depending on the whiskey type the kit is designed for, the barrel can be made either of charred or uncharred wood, or in some cases even come from barrels that have already been used for aging whiskey. Naturally, you’ll need to make the right kind of mash for the whiskey or bourbon in question and run it through your own still. A great excuse to make another run! A step above (or below as some may argue) are the barrel and essence whiskey making kits, which consist, you’ll be shocked, from a small wood barrel and a set of essence flavorings designed to get just the right color and flavor regardless of the spirit you’re pouring into the barrel. While this kind of kit may look like cutting corners and not “true moonshiner stuff” it may actually appeal to those who have a hard time sourcing the right raw materials for the mash or using column stills that deliver high-proof flavorless spirits. This type of whiskey making kit is designed exclusively for those who don’t have a still of their own but still want to enjoy the experience of aging something in a barrel. The poor souls get just everything, including the clear flavorless spirit, and have to wait for the end result just like everybody else while missing out the fun of distilling their own moonshine in the first place. Why would anyone choose this option instead of just buying a bottle of nice whiskey is beyond us. But there’s that on the market as well, and we just felt you have to be informed of all the options. Ready to try your hand at yer own whiskey, eh? Well, as you can see the market offers a wide range of options for you to consider. But when choosing the best whiskey making kit there are several variables you have to take into account. This one is obvious. If you want to make a bourbon you have to go with a bourbon making kit. For single malt whiskey get the respective product. Now, ideally you’d want to have a mash consisting of the type of grain or corn required by the respective drink. However, if you have problems sourcing the right raw materials, there are kits that come with flavoring essences that will give your moonshine just the right flavor and color during the aging process. The type of still you’re using can also affect the kind of kit you’d be likely to use. Pot still owners usually get richer base grain flavor going into the mash, so the barrel only kit type is certainly the best option for them. If you’re running a column still, the downside to getting those high proofs is the fact that your moonshine is much less flavorful than that obtained in a pot still. In this case you might want to look into the kits that come with flavoring essences. And if you don’t have a moonshine still… we have no idea why you’re reading this article in the first place. Read our reviews of the best options and go get one! Feeling adventurous? Build your own! It's best to plan this accordingly to the production volume of your still. Or should at least be comparable or even divisible by that. Say you have a still that produces 4 gallons of moonshine; you can either go with a single 4 gallon barrel, two 2 gallon barrels, or four 1 gallon barrels. The important thing here is that you top off the barrel with moonshine, leaving as little empty space as possible. The size of the barrel will also affect the maturation time. This factor has a significant impact on the color and flavor of the whiskey. The longer you keep the spirit in the barrel the more time it has to strip the color and flavor from the wood inside the barrel. But there’s also a strong correlation between maturation time and barrel size. Small barrels have more contact with the spirit because the relation of interior surface area and total liquid volume is greater than in case of a large volume barrel. This effectively means that it takes less time to get the same color and flavor with a smaller barrel than with a bigger one. For example, it may only take 3-6 months with a 2 gallon barrel to get the same oak barrel flavor in a whiskey that was matured for 3 years in a real barrel. Of course, there are other factors such as build quality, type of wood used in the barrel, custom engraving options, and absence of leaks (duh). But these all tend to differ a lot from producer to producer, so it’s more reasonable to take various kits and review them one at a time. Which we’ll be doing in the next section! The moment you all have been waiting for! We’ve picked some of the most popular whiskey making kits on Amazon and took them through scrupulous testing. Obviously, it would take us just too long to test out the final product made with any of these. Even so, judging by the build quality, material used, and kit composition it was possible to determine the best options on the market. So here we go! If you’re looking for a traditional copper still, this six gallon still may be for you. Like all of the stills on this list, it can be used for alcohol, essential oils, and water purification. This kit falls into the Barrel-only category and we really like it for its simplicity. Just straight medium toast oak barrel with bung, stand and spigot and that’s it. Comes in three volume options – 1, 2 and 4 liters (0.25, 0.5 and 1 gallon respectively) – so you will definitely find the right barrel for your still production volume. Some users have complained about leaks in the reviews, yet the one we got was just perfect. Nice stuff! Another whiskey making kit that only consists of an American white oak medium charred barrel. These guys, however, have a broader set of available sizes, ranging from 1 liter (0.25 gal) up to 20 liters (5 gal), which makes the barrels suitable both for home whiskey production and wine/beer aging. High quality and versatile, we really love that! We really liked the packaging approach of this kit, which comes in a neat box, with the barrel, essences and two shot glasses as a bonus. The build quality of the barrel is rather nice, and the essences claim to have that distinct Kentucky Bourbon flavor everyone loves. Using this kit is a breathe – just cure the barrel, pour in a clear spirit, add the flavoring essence and just wait. Good for those who don’t have the possibility to make a proper maize mash. 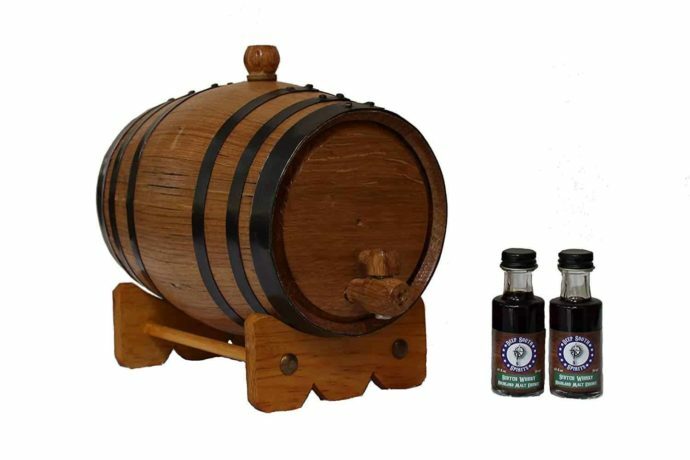 A nice American oak barrel kit that also comes with the essences to make Irish whiskey. We really liked the little extras this carries such as the barrel cleaning kit and a maturation chart – it’s all in the details. And you can certainly use this kit with white whiskey without using the flavorings to get virtually any type of whiskey. It comes at a heftier price than some other options here. Still, a recommended option. Want to make Highland Scotch Whiskey in the comfort of your home? Then this whiskey making kit will be a great pick for you. We really liked the detailed instructions that came with this kit. And the build quality of the barrel was rather good, though some users complained about their items. The big downside however, is that the max volume for this kit is 3 liters (0.8 gals), which isn’t very useful for those with larger stills. A barrel-only kit in this one that comes in a selection of only small volumes. But they have binder metal color options, which is nice, we suppose? 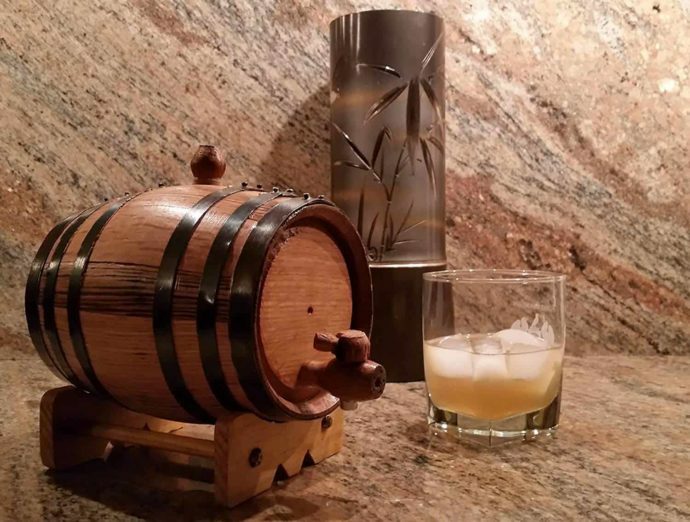 Either way, the barrel is made from American oak and charred to medium, which makes it a really versatile option for those who want to age a variety of drinks in this one. However, there was a distinct smell of wood glue coming out from the barrel, which is a huge no for this kind of products. A nice little American oak barrel that is perfect for small batch whiskey runs. We liked the overall build quality of this one. However, that’s the only thing you get for your money, no barrel cleaning kit, no maturation chart, no extras whatsoever. But some of yall might be okay with that if you know how long you want to age and have your own cleaning supplies. This was the most expensive whiskey making kit out of all that we’ve reviewed. For a 100$ you’d expect something special and worthy. Well, let’s see, only 1 liter (0.25 gal) volume option available at the moment, 3 flavor essences included, barrel cleaning kit, and a wrought iron stand. Yep, it must be the stand that makes all the difference, because other than that it’s just an ordinary barrel kit with essences. This kit is definitely one of the most versatile barrel and essence combos we’ve laid our hands on during the reviews. While the barrel itself comes only in the 2 liter (0.5 gal) option, there are 20 different flavor essences to choose from, and really good cleaning and maintenance kit to go with. All in all, this is one of the best whiskey making kits available on the market. A highly customizable barrel-only kit. You can order laser engraving at an additional cost, choose from three different colors for the binding hoops, and choose from four small volume options (though the seller claims they also offer barrels up to 5 gallons). And that’s pretty much it. While the barrel itself is well-built and is quite versatile in itself, we felt the kit should include a cleaning kit for the money it asks; but it's still one of our top picks among the bunch. These different whiskey making kits can help take your moonshine to the next level. What’s really great is that there are kits catering to both pot still and column still runners, allowing them to get as close to the authentic whiskey or bourbon look and flavor as possible using their respective spirits. 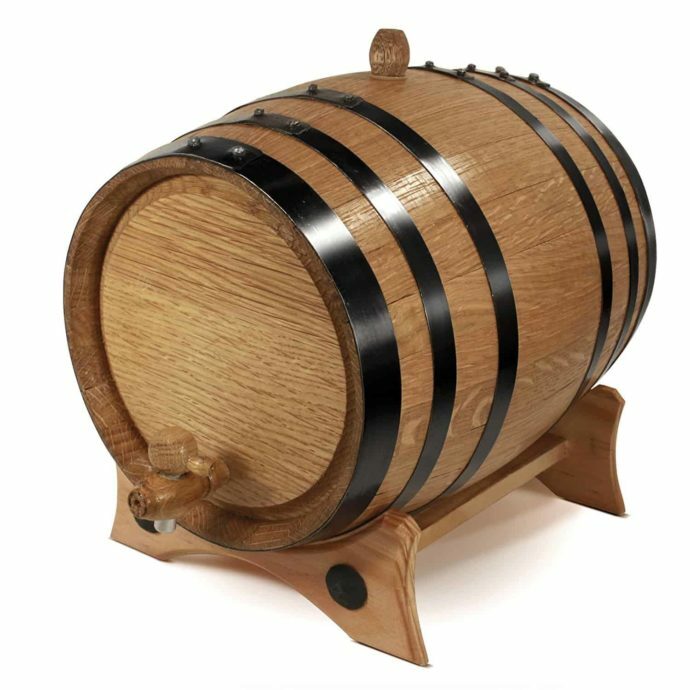 Our favorite barrel-only kit has to be the Customized American White Oak Aging Barrel. The barrel itself is well-built, versatile, and comes in a wide range of volumes that you can use for aging virtually any spirit. However, #10 above ain't too bad either! As for the barrel and essence combos, the clear winner is Custom Engraved American White Oak Whiskey Flavoring Gift Set. Not only is the vast selection of flavor essences to choose from a great feature, but it also comes with the best cleaning and maintenance kit out of all we’ve reviewed, and the barrel itself is really nice. So there you have it, the best whiskey making kits we could lay our hands on reviewed and ready to roll. Hopefully, we’ve made it easier for you to pick the right kit for your setup and inspire you to make your own whiskey or bourbon. It’s definitely a fun experience that can scratch your creative distilling itch in a very rewarding way. So fire up the still and get that tasty whiskey running!